GbR is a biennial workshop organized by the 15th Technical Committee of IAPR, aimed at encouraging research works in Pattern Recognition and Image Analysis within the graph theory framework. The 12th edition will be held in Tours (France), from June 19 to June 21, 2019. The proceedings are published by Springer in the Lecture Notes on Computer Science (LNCS) series. 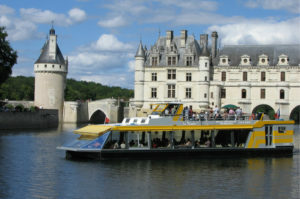 The social event is a river cruise on board of the restaurant boat LA BELANDRE, come and discover Le Château de Chenonceau in another way. This workshop series traditionally provides a forum for presenting and discussing research results and applications in the intersection of pattern recognition, image analysis on one side and graph theory on the other side. In addition, given the avenue of new structural/graphical models and structural criteria for solving computer vision problems, GbR2019 organization encourages researchers in this more general context to actively participate in the workshop. Furthermore, the application of graphs to pattern recognition problems in other fields like computational topology, graphic recognition systems and bioinformatics is also highly welcome at the workshop. Proceedings will be submitted for indexation by: DBLP, SCOPUS and Semantic Scholar. Follow us on Twitter @Gbr2019_Tours ! Papers from GbR2019 conference will be invited to submit a substantially expanded version to a Virtual Special Issue on "Advances in Graph-based Representations for Pattern Recognition", which will be published in Pattern Recognition Letters, in 2020.